*** The U.S. Supreme Court decided it didn't want to take sides with the estate of Burne Hogarth against Tarzan, and a lower court decided it didn't want to upset the Lord of Jungle either, when Johnny Weissmuller had his day in court. United Press International reported on March 22, 2004, that the high court would leave things as they were before Hogarth filed a suit against ERB Inc.
"WASHINGTON, March 22 (UPI) -- The U.S. Supreme Court Monday let stand a ruling that left the copyright of art in the 'Tarzan' books with the estate of the author, not the artist. 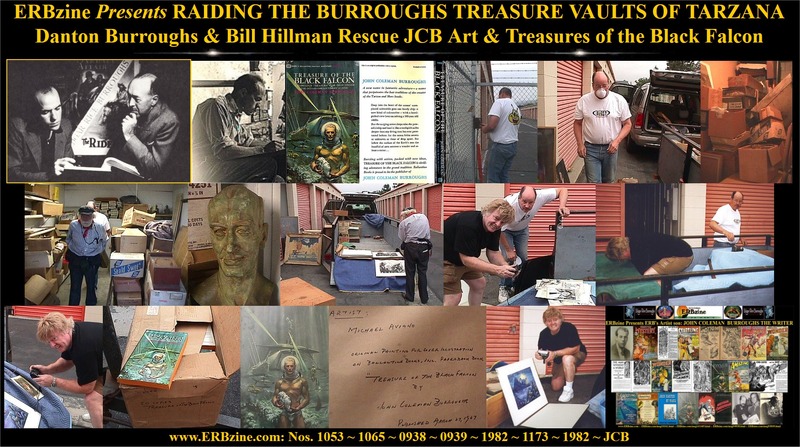 "The artist, Burne Hogarth entered into an agreement with the estate of the author, Edgar Rice Burroughs Inc., in 1970 to create pictorial versions of 'Tarzan and the Apes' and stories from the 'Jungle Tales of Tarzan.' Because the work was completed before the 1978 Copyright Act, the case was governed by the 1909 Copyright Act. In 2000, Hogarth's estate and family filed suit against ERB Inc., asking a federal judge to assign them the copyright to the artwork. Hogarth was an independent contractor, not an ERB Inc. employee, they argued. Hogarth assigned his copyright renewal right to ERB Inc., they conceded, but died before that renewal came about -- leaving the renewal right to his family, his estate contended. "A federal judge and a federal appeals court ruled for ERB Inc., and the Supreme Court denied review Monday without comment." Many years earlier, in 1942, a New York judge decided that Boy could go back to the jungle and live with Tarzan and Jane. The movie was "Tarzan's New York Adventure" and one of the supporting actresses was Virginia Grey, as a night club singer. Virginia was born on March 22, in 1917. An excerpt from information about Virginia's appearance as recorded at erbzine: "Jane and Tarzan go to a club to find Jimmie and meet the club's singer, Jimmie's girlfriend, Connie Beach (Virginia Grey), who fills them in on Buck's circus." Jimmie was the pilot who flew the plane in which Boy was spirited to the U.S.
A cylinder with 1,500 words spoken by ERB as he dictated "Tarzan of the Madman" still exists, thanks to the fact that his son, John Coleman Burroughs, saved it. ERB had begun the dictation on Jan. 16, 1940, and finished it March 22. The story, however, was not published until Canaveral Press did it in 1964. And we would be remiss if we didn't mention, in passing, that James Tiberius Kirk, who will grow up to command the Starship Enterprise, is scheduled to be be born March 22 anywhere from 2228 to 2233 in Riverside, Ohio. For an ERB connection, we note that Gene Roddenberry, creator of Captain Kirk, once wrote a script for a Tarzan movie that was never filmed. *** When Edgar Rice Burroughs became an Army private in the 7th Cavalry, he was stationed at Ft. Grant in Arizona Territory. It sounds like a romantic assignment, but being in the real cavalry was a gritty and boring job, made worse by ill-tempered officers. ERB soon tired of riding for days and sleeping in blankets soaked with horse sweat while chasing Apaches that didn't seem to want to be found. He soon enlisted the aid of his father to obtain a discharge. He had some good reasons, having been diagnosed with some heart troubles. ERB had to endure several more months of Cavalry life before finally getting his discharge on this date, March 23, in 1897. But ERB wasn't through riding horses. He enjoyed being in the saddle a lot more, however, when he moved to Idaho and worked on his brothers' ranch. Eventually, he moved on from that, too, and, after a number of other jobs, finally became that famous author whose riding experience enabled him to describe horse-riding accurately in a few Old West tales, though he will ever be more well-known for his stories of Tarzan and John Carter. As a bit of a homage to ERB's service, the movie "John Carter" included Ft. Grant as a scene of some of the action at the start of the film, where John Carter had a run-in with a Col. Powell, named after John Carter's friend in ERB's first Martian story, "Under the Moons of Mars." Both ERB and the movie John Carter were glad to get away from Ft. Grant, and John Carter was particularly happy when his trail led to the planet Mars, where he found "A Princess of Mars." *** After the Japanese attacked Pearl Harbor in 1941, ERB had occasion to refer to his Cavalry discharge date. He had become involved with and was a staunch supporter of the BMTC (Businessmen's Military Training Corps), a civilian readiness organization. An ex-master sergeant, in a letter to the "Honolulu Advertiser," had questioned the wisdom of placing arms in the hands of men not qualified to use them. An annoyed ERB answered the letter by telling of the training procedures and weapon instructions which were part of the BMTC course, and he added,in his "Laugh It Off" newspaper column of Sept. 30, 1942, "BMTCers Can Shoot: There are many old-time Army men in the BMTC. Mr. Pinchon should be in it. We need all the experienced men we can get, regardless of age. From the date of his service, 1898, I judge that Mr. Pinchon is about the same vintage as I, although probably younger. I was discharged from the 7th Cavalry in 1896 (actually March 23, 1897 after ten months' service). "Paladines of Paradise" By Maj. Edgar Rice Burroughs, B.M.T.C. *** Did ERB read "The Chicago Tribune" thoroughly on March 23, 1901? If he did, he must not have taken it to heart, or we might have been reading "John Carter of Sumatra" or some other exotic locale on Earth. The article, by Professor Edward S. Holden, pretty much debunked the idea that there could be life on Mars. "These are not the conclusions that have been generally accepted by the readers of recent popular astronomical literature. But any one who will take the pains to examine all the evidence can come to no other judgment." The article said that humans would likely freeze solid before long if hopping about on the surface of Mars. Well, at least now we diehard ERB enthusiasts know why Dejah Thoris made a hand-signal to John Carter that she needed help. With hardly any clothes on, the poor Princess was probably about to catch her death of a cold! *** A March 23, 1945, file photo showed six-year-old Johnny Weissmuller Jr., looking up to his former swimming champ dad Johnny Weissmuller, with 14-year-old Johnny "Boy" Sheffield of Pasadena, Calif., in the centre. 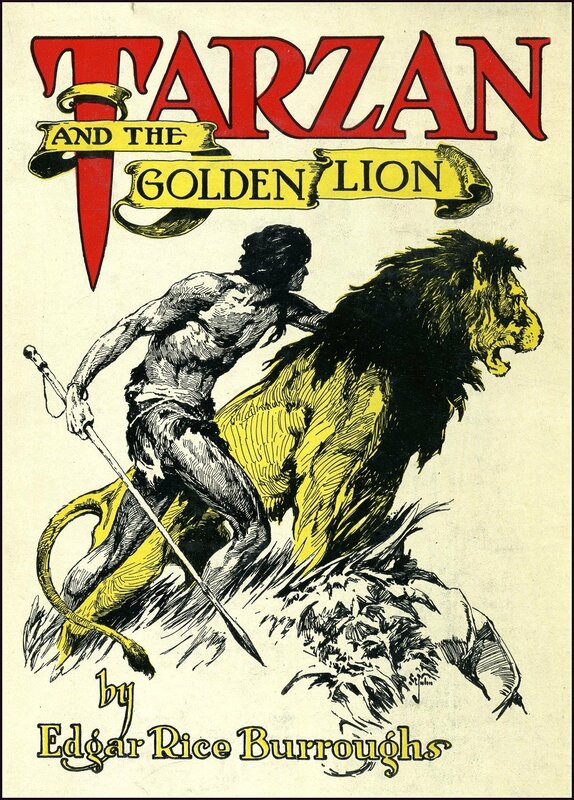 *** If you are an illustrator who is asked to design a cover for a new edition of "Tarzan and the Golden Lion," it might be that the first thing you would think of is how to depict Tarzan and Jad-bal-ja, and particularly in a way that has not already been done. The task was a bit easier for J. Allen St. John. His only predecessor was P.J. Monahan, who designed the cover picture for the "Argosy All-Story Weekly" in which the story first appeared on Dec. 9, 1922. St. John's idea was also to depict Tarzan and the lion, but a bit differently. Monahan's looked as if Tarzan was attempting to restrain his jungle companion, while St. John's showed man and beast more relaxed, but vigilant. Monahan's lion had his head low; St. John's had his lion's head high. St. John also departed from the usual practice of using paint for the cover illustration. He used a black and white line drawing, though the lion was colored "lion yellow" on the finished product. The book edition of "Golden Lion," with St. John's illustration, was published March 24, 1923.  Both are classic images and have been used repeatedly over the years by ERB Inc. to identify the Tarzan brand. 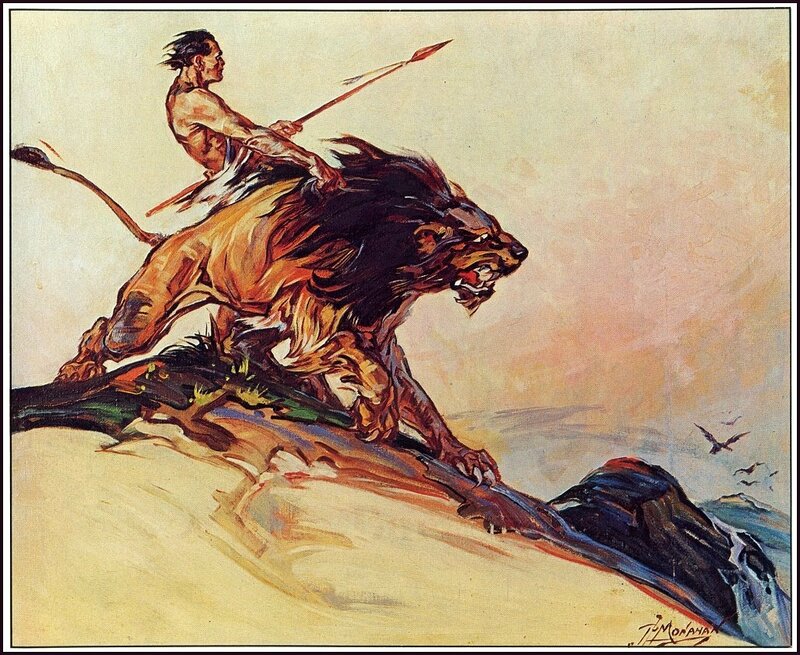 A newer version, patterned by Roy G. Krenkel in the pose of the Monahan version, was used on the cover of "Edgar Rice Burroughs: The Man Who Created Tarzan," by Irwin Porges, and is also dominant in the current ERB Inc. Tarzan logo designed by Thomas Yeates. There are many artists who have made illustrations of Tarzan with his lion. It is a favorite subject. *** Smylla Brind was born March 24, 1928, in Vienna, Austria. Her family fled to France in 1937 to escape Nazi persecution of Jews and she ended up in the U.S. a few years later. Her interest in a stage career was aided by her fluency in several languages (German, French, and Italian as well as English), by her Teutonic accent and by her IQ of 165. She also exceled at oil painting. RKO Studios changed her name to Vanessa Brown and she played the role of Jane to Lex Barker's ape-man in 1950's "Tarzan and the Slave Girl." *** "Tarzan Returns to Castra Sanguinaurus," written and illustrated by Russ Manning, began in Sunday newspapers March 24, 1974, and ran for 33 Sundays. *** Nancy Kelly, who provided the female pulchritude while Jane was off in London in "Tarzan's Desert Mystery," was born this date, March 25, 1921, in Lowell, Mass. Bill Hillman's ERBzine describes "Desert Mystery" this way: "In response to a letter from Jane, who is in England nursing British troops, Tarzan and Boy trek across the desert looking for jungle plants to be used in creating a malaria serum. On the way they save a Jaynar, a wild horse, from a German, arrive at an Arab city and rescue a stranded American magician, Connie Bryce (Nancy Kelly). When they reach Bir Herari they meet Hendrix, who is really the Nazi, Heinrich, whom Connie is on a mission to expose. Heinrich arrests Tarzan as a horse thief. Heinrich and his crony, Strader, follow Connie who is delivering a message to the sheik's palace. The Germans kill the sheik's son, Prince Selim (Robert Lowery) and frame it on Connie, who is sentenced to hang. Tarzan escapes and summons the stallion Jaynar and during the resulting stampede, Tarzan is able to rescue Connie and take her to a nearby jungle where Tarzan fights off prehistoric monsters to obtain the fever medicine. He battles a maneating plant and throws the Nazis to be killed by a giant spider." For you Maverick fans out there, Nancy Kelly was the sister of Jack Kelly, who played Bart Maverick. Nancy herself was in lots of TV westerns as well as other series and movies, including her role as the suicidal mother in both the stage and film versions of "The Bad Seed," for which she had an Academy Award nomination. "Tarzan and the Sheik" was a title that was under consideration for this movie. Some posters were even printed with that title. At the 1989 ECOF in Tarzana, when Forrest J Ackerman invited ERB fans to tour the collection room at his home, Roy White spotted one of those posters in Forry's "for sale" room and bought it. Tarzan and the Golden Lion:: hardcover, Rex Maxon strip ~ John Celardo Tarzan strip *** Edgar Rice Burroughs incorporated his name on March 26, 1923. A few months later, "The Girl from Hollywood" was published as the last ERB novel to be copyrighted by him alone. The first book to have the "Inc." added to his name was "Pellucidar," which came out on Sept. 5, 1923. ERB Inc. did not start doing its own book printing until "Tarzan the Invincible" came out in 1931. In 1948 on this date, the Burroughs Corporation published its last first edition book to come out during ERB's lifetime, Llana of Gathol. On the same date, it published reprint editions of the later Tarzan titles, along with the previous Mars titles and the first three Venus titles. Llana of Gathol entry in our C.H.A.S.E.R Biblio: Publishing history, cover and interior art, etc. *** "Tarzan and the City of Gold," illustrated by Rex Maxon and scripted by R.W. Palmer, began running in daily newspapers on March 26, 1934, and continued a total of 120 days. 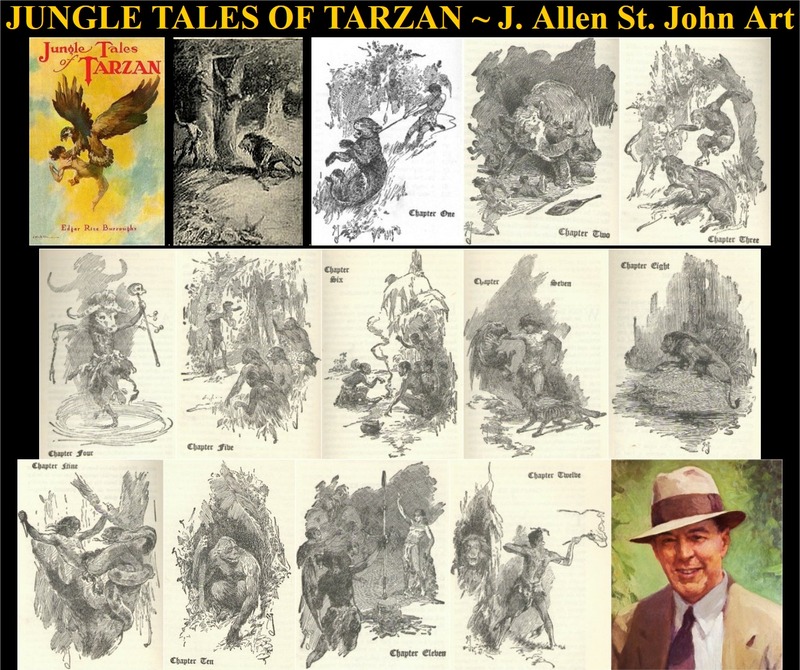 *** "Tarzan and the Storm," written and illustrated by John Celardo, began March 26, 1962, and continued for 36 days. and former husband of ERB's second wife, Florence Gilbert. He was also a veteran film actor, having starred in dozens of silent movies. *** Fifty-five years later, on March 27 of 1988, you could settle in for 12 Sundays of reading "The Tigers of Madhya Pradesh" in the Tarzan Sunday comics and, along the way, you might figure out how to pronounce "Madhya." The story was done by Gray Morrow, illustrator, and Don Kraar, writer. ERB wrote of Tarzan-tiger encounters by mistake in his first book, and on purpose in "Tarzan and 'The Foreign Legion'," the last Tarzan book published in his lifetime. Meanwhile, comic illustrators and writers have often found ways to put the ape-man into encounters with the great striped cats, and so it is in the saga of Madhya Pradesh. *** ERB had trouble getting "The Outlaw of Torn" published, but it finally appeared in five monthly installments of "New Story Magazine" in 1914. Getting it into hardback proved another challenge, but 13 years later, on Feb. 19, 1927, he finally achieved that goal as well. A.C. McClurg didn't have as much faith in the story as ERB did, printing just 5,000 copies, but ERB received a measure of satisfaction when, just over a month later, on March 28, 1927, McClurg informed him the edition was a sell-out. ERB, at that time, considered "Outlaw" to be one of his three best stories. 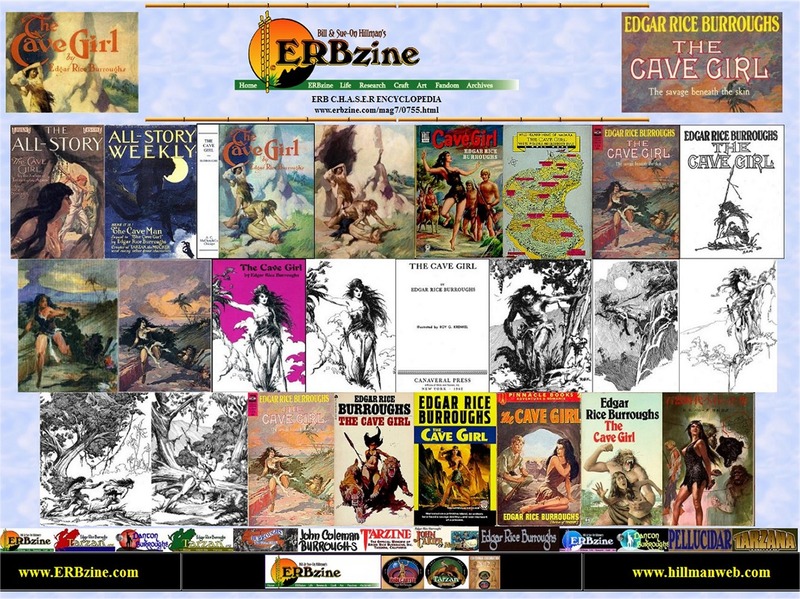 Background, Cover and Interior Art, Publishing History, Summary, Reviews, ERB's Opinion, Pulps, Links, etc. *** On March 28, 1929, ERB let "Blue Book" magazine know that he was planning to start a new series, this time set on Venus. Four years later, the first story, "Pirates of Venus," appeared in the pages of a pulp magazine. But it was serialized in "Argosy Weekly," not "Blue Book." *** "Treasure of the Black Falcon" by ERB's son, John Coleman Burroughs, appeared on paperback racks in March of 1967 and was quickly snapped up by many fans. There followed a lot of letters by fans to JCB, sent via Hulbert at ERB Inc., and many of them are shown at the ERBzine website, including one written on March 28 of that year by James Bleton in Winchester, Hants, England. Belton asked, "Are you interested in obtaining any of the early English 1st Editions Burroughs titles? I see various 1st Eds. at times, looking around the second hand bookshops. Naturally, you will have them all, but possibly some issues are not in good condition. "Just before Easter I received a copy of 'Treasure of the Black Falcon' sent by Rev. Hardy H. Heins. I have just finished it, and I enjoyed it very much.. It certainly did cheer me up, and I should like very much to congratulate your brother John Coleman Burroughs on a great job. "I must explain further about cheering me up. For some time I have been troubled with sharp pains in my chest (upper) and last Thursday I was carrying a cup of coffee upstairs to my wife, when this sudden pain overcame me, and I unfortunately dropped the cup. My wife called for our doctor -- who, at once placed me on a diet, and I have to see a specialist on 29th March at our local hospital. I certainly hope all is well." *** "Jungle Tales of Tarzan" was published in hardback by A.C. McClurg & Co. on this date, March 29, in 1919. It was one of the most prolificly illustrated ERB Tarzan books, with a full-page illustration on regular book paper at the start of each of its 12 chapters, plus five illustrations on coated paper, including the frontispiece. The first printing of the first edition is in orange binding and later McClurg editions are in green. John Martin bought his first edition of this at a reasonable price somewhere or other many years ago. Around that time (over 20 years ago), John and his wife were travelling up the Oregon Coast, stopping in antique and book stores along the way. One thing he found out -- Coastal Oregon antique stores all had extra high prices on everything. They stopped in one town and he saw an orange Jungle Tales with price well over $100. They stopped in another store in the same town, and they also had an orange Jungle Tales, priced similarly. Going on to yet a third store in that town, and there also was an orange Jungle Tales with a price of over $200. "Gee," he said to his wife, "that must be priced so high because it's a really scarce book." *** Christopher Lambert, who performed as ERB's Tarzan for half a movie in "Greystoke: The Legend of Tarzan, Lord of the Apes," was born March 29, 1957 in Great Neck, Long Island, New York. 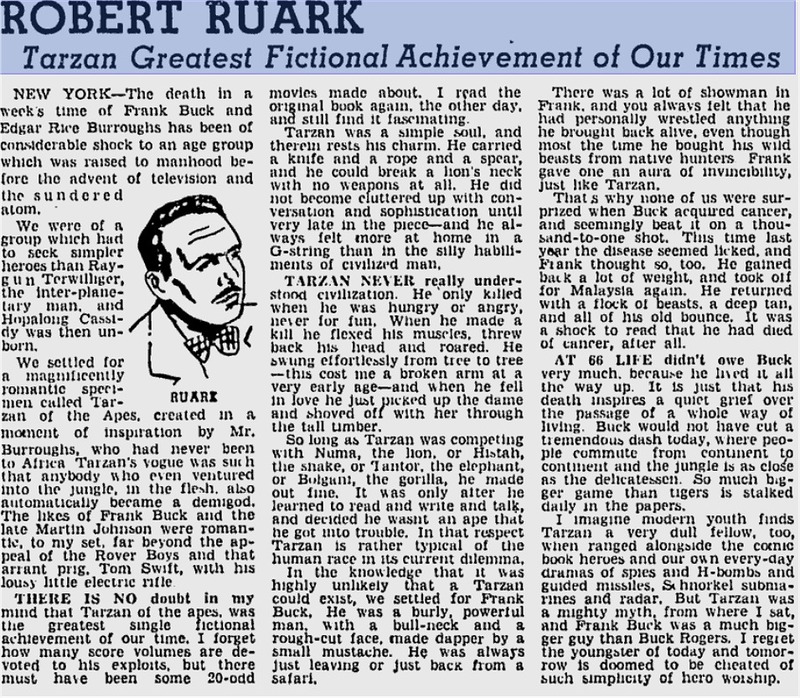 *** Robert Ruark, who fell in love with Africa and wrote a book, the title of which likely inspired the name of a Star Trek character (Uhuru), also had something to say about Tarzan of the Apes. He called him the "greatest single fictional achievement of our time" in a column he wrote on March 29, 1950. *** On this date in 1935: Tarzan and Jane (Tarzan's Quest) was rejected by Argosy who considered it to be too stereotyped. It was later published in Blue Book. *** Ajor, a cutie from Caspak, was born this day, March 30, in 1949. Oops! That wasn't Ajor! That was Dana Gillespie, the girl who played Ajor in the 1977 film, "The People That Time Forgot!" At birth, in London, Dana's full name was Richenda Antoinette de Winterstein Gillespie. Nine years before starring in "People," Dana was in a movie titled "The Lost Continent." Alas, it was not ERB's "Lost Continent," although the plot description makes it sound like a cross between an ERB plot and the backup feature on Mystery Science Theater 3000. IMDB reveals: "This film starts out like the Love Boat on acid, as a cast of varied characters, with various issues, take Captain Eric Porter's leaky cargo ship to escape their troubles. When a violent storm strikes, the ship is swept into the Sargasso Sea and our heroes find themselves trapped on an island of man-eating seaweed, populated by giant monster crabs and some Spanish conquistadors who think the Inquisition is still on." Dana's last role on celluloid was in 1990. So what's she been doing since then? Singing the blues, man! Check out her website. *** "The Law of the Jungle," written and illustrated by Rex Maxon, began March 30, 1946, and ran for 51 days. *** "Tarzan and 'The Fox" written and illustrated by John Celardo, began March 30, 1964, and ran for 36 days. (Note: There was also a Harold Foster story called "Tarzan and the Fox" which ran back in 1932). *** "The Cave Man," sequel to "The Cave Girl," was first published as a serial, starting with the "All-Story Weekly" issue dated March 31, 1917 -- 101 years ago. If you had been among those who had read "The Cave Girl," the earlier novelette serialized in the summer of 1913, your wait for the rest of the story would have been over three and a half years. That's long enough to have forgotten a lot about Nadara and Waldo Emerson Smith-Jones, but fortunately "The Cave Man" text was preceded by a recap with "the story thus far." *** On March 31, 1937, ERB wrote a letter commenting on the sources of his ideas for the creation of Tarzan. He was responding to a letter written to him two days earlier by Rudolph Altrocchi, a University of California, Berkeley, professor of Italian studies. ERB stated, "I believe that (the Tarzan concept) may have been originated in my interest in mythology and the story of Romulus and Remus. I also recall having read many years ago the story of a sailor who was shipwrecked on the coast of Africa and who was adopted and consorted with great apes to such an extent that when he was rescued a she-ape followed him into the surf and threw a baby after him. Then, of course, I read Kipling: so that it probably was a compilation of all three of these...." (From "Tarzan: The Centennial Celebration," 2012, by Scott Tracy Griffin, page 26). Altrocchi was doing research for a book, "Sleuthing in the Stacks," which would be published six years later in 1943. The book contains chapters on a wide range of literary achievements of the past with Altrocchi's investigations and ideas about books and characters, written with his hope that the volume would be "a jolly, bookish escape." Purchase a copy of "Sleuthing in the Stacks"
A bit of sleuthing concerning "Sleuthing in the Stacks"
Review of Atamian's treatise on "The Origin of Tarzan"